I was shaking my head during this entire book. Oh Molly, you are such a trouble maker and I like it. From the beginning, Molly Tyler of the small town of Destiny New York was determined to do her own thing in her nervous, hyperactive way. 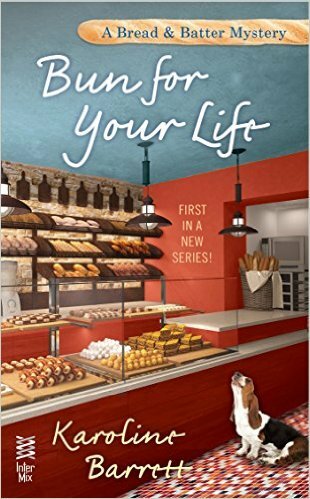 Bun For your Life by Karoline Barrett was a fast-paced romp through the life of baker and co-owner of “Bread and Batter”, Molly Tyler as she tries to solve the murder of the town’s wealthy apple orchard heiress. With her own involvement in the murder being questioned by the new detective in down, Sean Corsino, Molly sets out on her own quest to find the killer while putting her and the people around her in danger. This book was not only entertaining and fun to read, but the characters were well-rounded and the humour thrown in was fantastic. Molly is witty even if she doesn’t mean to be and that is what makes this main character so fantastic. With that being said, her reactions are often times over the top and campy. As they say, they broke the mold when they made that gal. I would recommend “Bun For Your Life” to anyone who likes trying to solve a murder, but also doesn’t want something heavy and gruesome. There are plenty of chuckles and quite the twist at the end of the book that no one sees coming. I was happily surprised by the book’s ending and how the “bad guy” was found out. Genius! I look forward to visiting Destiny in the next book and seeing Molly and the gang again. There is no telling what that lady will get in to next time.